Melville, N.Y., April 21, 2015 – Henry Schein, Inc. (NASDAQ: HSIC), the world’s largest provider of health care products and services to office-based dental, animal health and medical practitioners, has partnered with MCW (Miracle Corners of the World), a non-profit organization committed to global youth development, community development initiatives and oral healthcare in Africa, to increase access to oral healthcare for the underserved population in Tanzania through education and training. 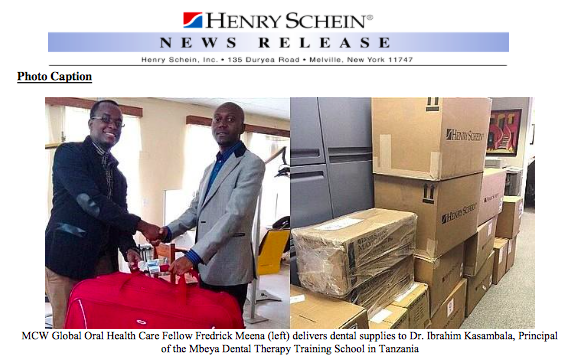 Henry Schein donated masks, gloves, hand sanitizer and toothbrushes valued at more than $20,000 to support the unique educational program, which will use primary school dental outreach as a key training opportunity in community dentistry for dental therapists in Tanzania. The dental therapy training school has long recognized the importance of preventive community-based dentistry. Access to dental supplies needed for teaching the students how to set up and implement effective school-based programs is unreliable. ”Seventy percent of Tanzanians live in rural communities with little to no oral healthcare access,” said Dr. Bergman, Director of MCW Healthcare Projects. “Preventive care is key to improving oral health, particularly in resource-poor settings. Our focus is on helping the dental therapy schools train their students on how to set up school-based preventive oral health programs so they can do this effectively once they graduate and are deployed to the regions.” With the help of Henry Schein Cares, access to health care for underserved and at risk populations around the world in the areas of wellness, prevention, treatment and education, emergency preparedness and relief, and capacity building is possible.